The exponential growth of the retail sector is one of the factors that is expected to drive the growth of the global compound chocolate market during the forecast period. The retail market in APAC is growing faster than that in Europe and North America due to the strong economic growth witnessed in the countries in the region. Therefore, global players in the retail market are opening new stores in APAC to take advantage of the growing opportunities. The most common distribution channels used for compound chocolate are supermarkets and hypermarkets, convenience stores, discount stores, and online portals. E-commerce is gaining popularity as a sales medium for compound chocolate and is expected to contribute to the growth of the market during the forecast period. As per Technavio, the growing trend of premiumization will have a positive impact on the market and contribute to its growth significantly over the forecast period. 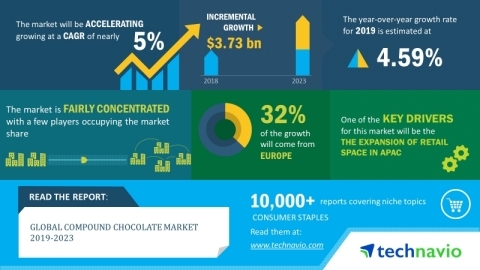 This global compound chocolate market 2019-2023research report also analyzes other important trends and market drivers that will affect market growth over 2019-2023. The preference for premium chocolate products is increasing among consumers as they perceive premium products to have better quality, specific origin, finer flavors, and ethnically sourced ingredients. The improving lifestyles of consumers as a result of the increase in disposable incomes and growing health consciousness will also drive the demand for premium and luxurious confectionery items. Various vendors in the market have launched a premium product range, exclusively to target elite customers. Moreover, these premium chocolate products use 100% cocoa butter and not compound chocolate as an ingredient, which might hamper the growth of the market during the forecast period. "Another major factor driving the global compound chocolate market is the rise in the price of cocoa butter. The increasing price of cocoa butter is encouraging players in the baking industry to switch to compound chocolate, which does not contain cocoa butter, and hence, is priced much lower than real chocolate. The average price of compound chocolate is about USD 0.25 per oz., while the average price of cocoa butter is about USD 1.25 per oz. Thus, players are switching from cocoa butter to lower-priced compound chocolate. Thus, the rising price of cocoa butter will turn out to be favorable for the growth of the global compound chocolate market during the forecast period," says a senior analyst at Technavio. This market research report segments the global compound chocolate market by product (milk compound chocolate, dark compound chocolate, and white compound chocolate), and geographical regions (Europe, North America, APAC, South America, and MEA). The European region led the market in 2018, followed by North America, APAC, South America, and MEA respectively. However, during the forecast period, the APAC region is expected to register the highest incremental growth due to the growing popularity of chocolate such as dark chocolate and gourmet chocolates.